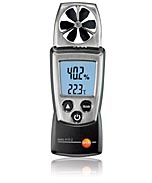 Testo 410-1 measures air speed and temperature. It is ideal for quick spot checks at air outlets on account of its integrated measurement with the 40mm vane. Timed mean calculation is possible. In addition to air speed and temperature, testo 410-2 also measures air moisture. Testo's very own, patented humidity sensor guarantees accurate readings. In this way, air conditions can be reliably checked.